In 1903, fearful that the Chinese were on the verge of granting Tibet to Russia and endangering their Raj in India, the British sent a military expedition into Tibet to prevent the rumor from becoming a reality. The commander of the expedition, Sir Francis Younghusband, brought along British civil servant and photographer John Claude White to document the campaign. White took a series of seventy photographs which were collected in an album c. 1905. Amongst the platinum prints and two folding panoramas is this striking image of Tibetan nuns. 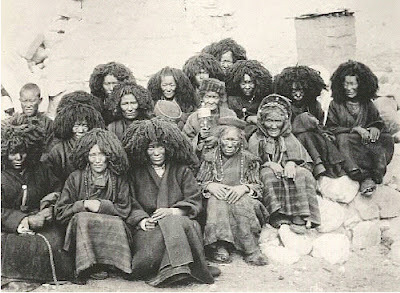 Considering that Buddhist nuns are required to keep their hair cropped short it is unclear why this group allowed their hair to grow to such impious length. As recently as 2002, the Chinese were imprisoning Tibetan nuns and forcing them to let their hair grow out, the least offensive of their many humiliating punishments. The Tibetans were none too happy with the British incursion, the Chinese even less so, and the British were none too kind to the Tibetans. Brigadier-General James Ronald Leslie Macdonald, leading a military force of over 3,000, including Nepalese Gurkhas, faced off against 3,000 Tibetan troops armed with muskets at the Battle of Guru, and a very short battle it was. After negotiations to head things off failed, confusion ensued and the shooting began. The British, armed with Maxim machine guns, mowed down between 600-700 Tibetan troops. The rest were allowed to peacefully retreat. Younghusband, who now assumed command of the British army, marched into Lhasa and negotiated a treaty with the Regent, who declared, "When one has known the scorpion [China] the frog [Britain] is divine." The British military mission ended in 1904, unpopular at home and everywhere else. This album was recently at Bonhams for auction. It sold for £38,400 ($61,592), inclusive of buyer’s premium. Booktryst thanks Bookdealer for the lead. Which begs the question, Why would they be wearing wigs? Imprisonment of tibetan nuns is ongoing. If you trawl through www.phayul.com (the main news clearinghouse) you will find out reports of lots of recent cases. BTW: Don't try to get on Phayul right now - it has been under cyber attack for the last three days.